Gentle in Word, Humble in Deed. Sowers in God’s Name (SiGN) was conceived on 5th September 2009, in the year of the Parish’s 50th anniversary celebrations. In Dec 2009, SiGN sent her first parish mission team to Cambodia which was quickly followed by 4 other exploratory mission trips to Cambodia, Philippines and Sabah. In April 2012, our parish decided to support the work of the Congregation of Franciscan Sisters of the Immaculate Conception (FSIC) in Paitan, Sabah. More specifically, SiGN would support the kindergartens set up by FSIC for the children of Paitan, because we affirm their conviction that education is an agent of change – a change for a better future, and where better to start than with the children. Since its inauguration, SiGN working with SFX parishioners have sent over 14 missions to Paitan resulting in over 50 SFX parishioners being exposed to overseas mission work and evangelisation. 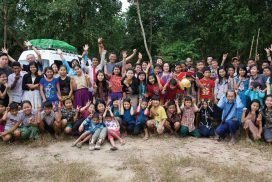 In 2016, SiGN embarked on expanding its mission field by going to Myuang Myeik in Myanmar to support the work of a local priest (Fr. Benjamin) who started an orphanage there 25 years ago. Since then, SiGN has sent two mission teams to explore how we can support the local priest’s efforts in sustaining the children’s faith and education.